Hover over the GIF and click the ESPN logo on the bottom left. 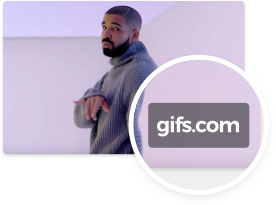 If you already have a GIF, click "Upload GIF" above. Otherwise, convert a YouTube video with "YouTube to GIF". Then click "Create GIF" to get started! Edit your GIF to perfection, then click "Create GIF." We'll be done processing it in a jiffy. In the bottom left corner, select where you'd like your .GIF to link back to. Twitter and Reddit are popular! Finally, use the provided HTML embed snippets to either put your gif on your website, or share your GIF to Twitter, Facebook, or anywhere else. Repeat Steps 1-4 to make as many GIFs as you want!